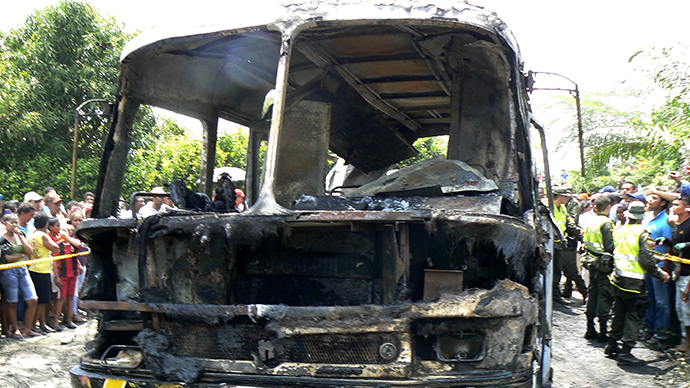 At least 32 children were killed after a bus taking them home from a church event caught fire in northern Colombia on Sunday afternoon. "The preliminary death toll is 32 children," said local police chief general Rodrigo Gonzales, according to El Comercio. Earlier, authorities in the northern town of Fundacion said that 26 minors were killed in the fire. Colombian President Juan Manuel Santos lamented the tragic death of the children, expressing sympathies to their families. "The country is in mourning," he said on Twitter. The mayor of Fundacion, Luz Stella Duran, said that 40 to 50 children were on the bus, accompanied only by the driver, as it traveled from Fundacion to the town of Bosconia. Around 10 children are receiving medical help, she added. An investigation is underway into the cause of the fire. However there are speculations that contraband gasoline could have been behind the accident, El Tiempo newspaper reported. Adan Leon, chief of Magdalena Police Department, said the tragedy occurred Sunday afternoon as the children were returning home from a church mass. Pictures on local media and Twitter showed graphic images of charred bodies in a completely burnt vehicle.